Update: Pictures of Honourable Maharashtra CM has been included. CEAT Tyres today announced its plans to invest INR 400 crore in a state-of-the-art tyre plant in Butibori, Nagpur. 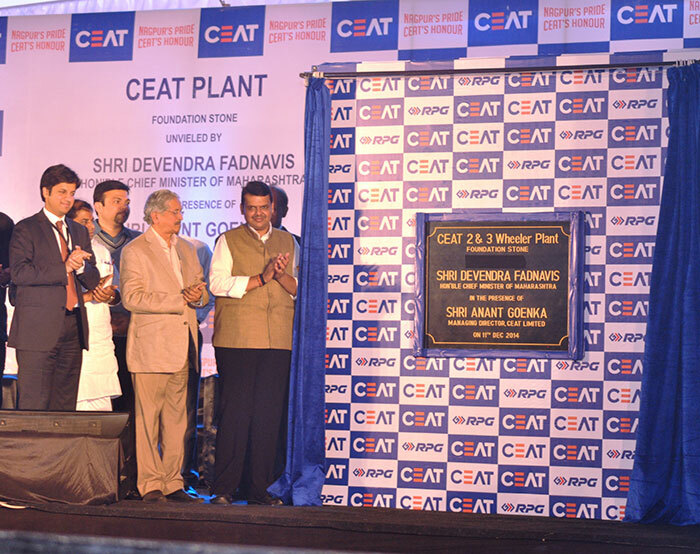 In an event organised to commemorate the foundation stone laying ceremony of the new CEAT plant, Hon’ Chief Minister of Maharashtra, Devendra Fadnavis laid the cornerstone for the plant that will be set up in three phases. In the first phase (2014- 2016), INR 400 crore will be invested. The completion of the phase one of the plant and the first tyre rollout from the plant is anticipated by April 2016. This state-of-the-art tyre plant will be spread across 60 acres of land and is expected to manufacture 1.2 million tyres. The new plant will have the best in its class technology and will manufacture two and three wheeler tyres. The production process will have the certification of ISO 14001 for environment management system and OHSAS 18001 for safety, health and evvironment. The new plant will have highly automated manufacturing machinery chosen from the world market. The two wheeler production volumes are expected to double in the next two years owing to the capacity.